This article covers Top 10 Free Online Circuit Simulator Websites. 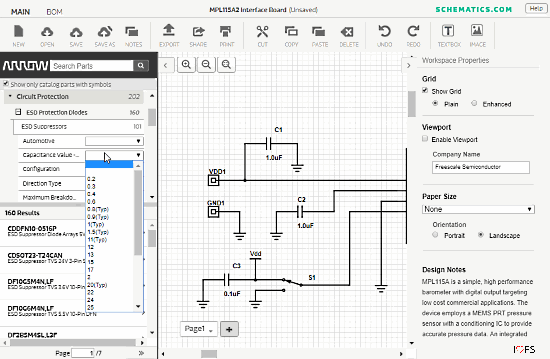 We tested a number of online circuit simulators where you can design basic (and advance) electronic circuits. And, we brought to you the best 10 circuit simulators from that based on usability and functionality. Some of these simulators also have the functionality to run test and analyze the design and give output on that test. With these circuit simulators, you can test your design even before getting any actual component and can be sure and confident about your electronic circuit. 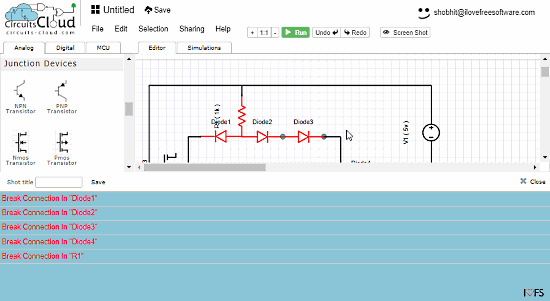 Talking of circuits, check out this Free Software to find the Component Values of a Circuit. Schematics.com is free online schematic drawing tool. It has a circuit simulator where you can build your circuit with hundreds of components to select from. You can browse electronics designs and projects built by other people. You can also search for any particular type of project, in case you have something in mind. From there, you can share a project with others, clone it to your account, and can directly open it in the editor as well. 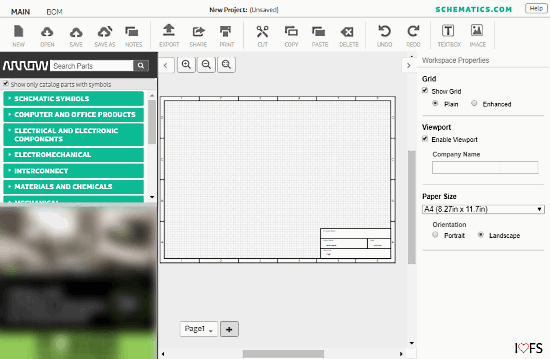 Also, you can create your own project and start building your design from scratch. This online circuit simulator has a background paper with grids, which can be helpful for the symmetry of design. You can set paper size as per your need. With all these components, you can design basic as well as complex electronic circuit online. 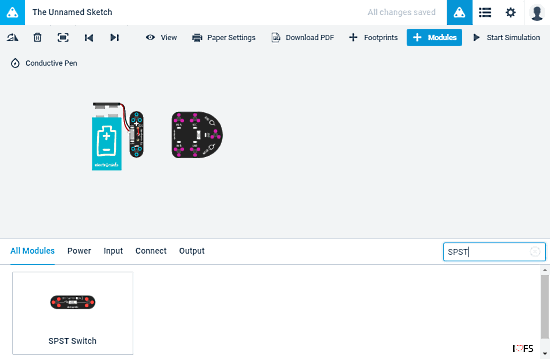 You can save your circuit online or can export it as an image (PNG, SVG) or a document (PDF). It also allows you to export a selected area of your circuit. Simulator.io is a website with an online circuit simulator. 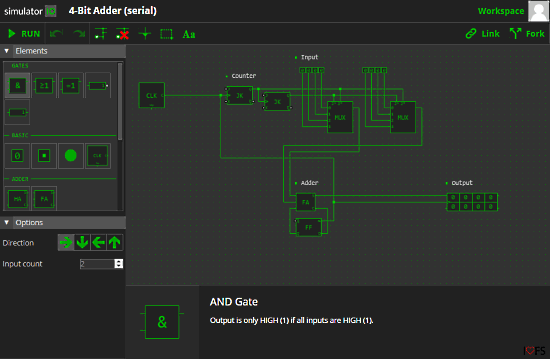 Here, you can simulate basic electronic circuits, like basic gates, adders, registers, counters, etc. 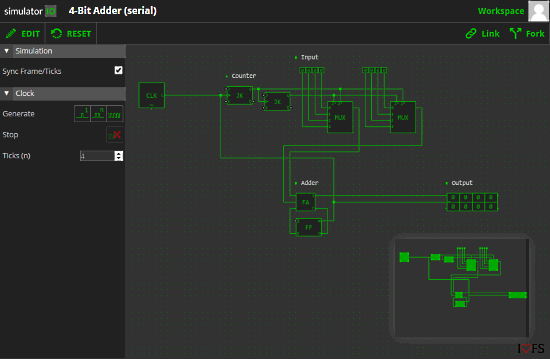 It has online circuit samples that you can access and import into your editor. Simulator.io has a simulation mode, where you can test your circuit. You can interact with the simulation in real time using switches and clocks. The wires with power in them get highlighted in the simulation. And, you can also control the clock signal for your circuit in the simulation. This simulator has other additional useful features as well. You can share a snapshot of your circuit by creating a shareable public URL. You can also add up to 7 other people to collaborate with you on a project. Give Simulator.io a try here. 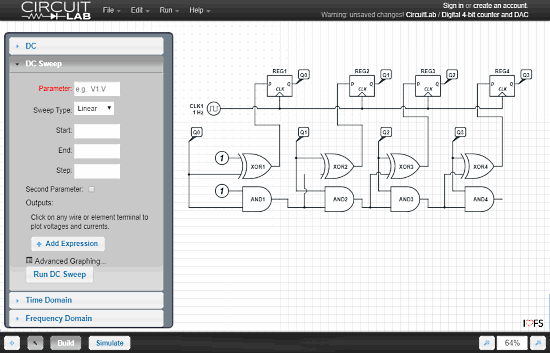 Circuits.io is an online circuit simulator that has electronic modules with near to real appearance. Most of the other circuit simulators use symbols or signs for electronic components. But, here you can see how those components actually look. For example, other simulators just use the symbol for OR Gate; here, you can see all the input and output points, you can easily differentiate between Vcc and Ground just by looking at it. You can make your electronic circuit public, and others can use it as a module for their circuit. 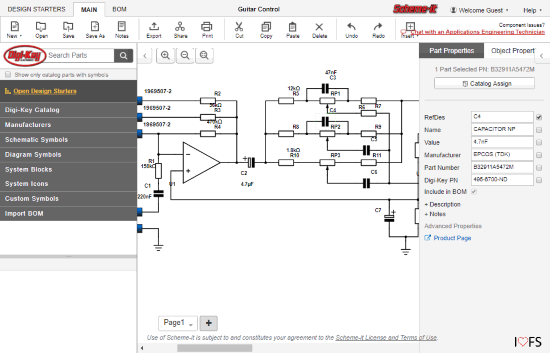 This online circuit simulator has Basic and Advance view modes. If you find the actual look of modules confusing, you can always switch to the basic mode which uses symbols for modules. 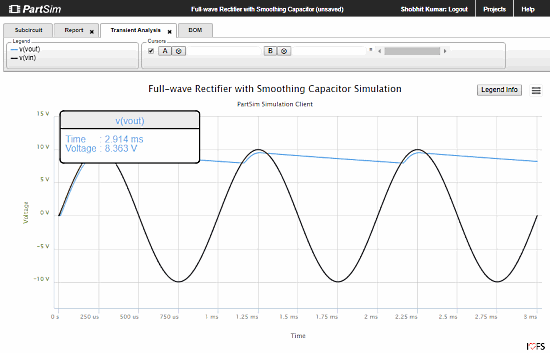 You can test your circuit by running the simulation. Also, you can download your circuit as PDF. Circuit-Cloud.com is an online circuit simulator with a decent public circuit library. Here, you can build and simulate basic as well as complex electronic circuits. You can also embed modules from online library to your circuit. You can share your circuit with specific people from the simulator or you can make it public. All your circuits which you make public, will be included in the public library. You can make them private any time you want. You can simulate your electronic circuit anytime and it will show you the output results. As you can see in the above screenshot, my circuit is incomplete and it showed me all the errors while I tried to simulate it. Falstad.com is a website with lots of education focused simulators. You can simulate various Math, Physics, and Engineering applets there. Online circuit simulator is one of those applets. It is good for basic circuit design, especially for high school students. 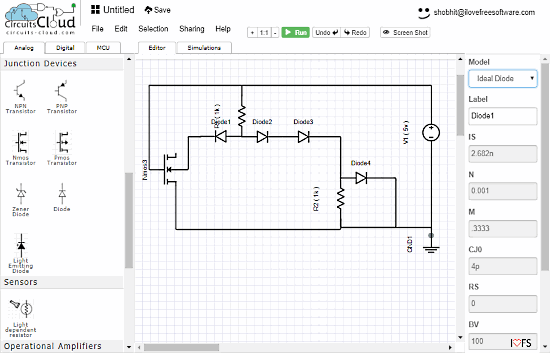 You can mimic almost any type of basic electronic designs in this simulator. Many other simulators in this article let you simulate your design for testing, but this one does that differently. It animates the direction of current flow in the circuit. And, the output of all the components in the circuit is shown in the form of wave graph with values. 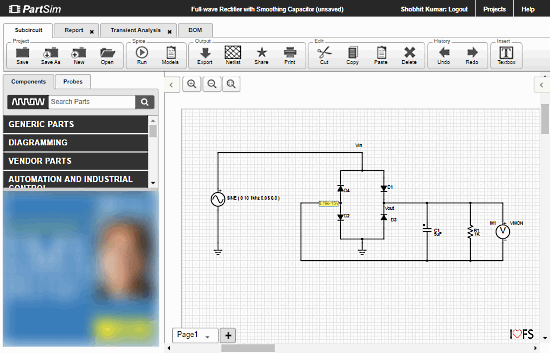 PartSim is an online circuit designing tool with a wide variety of components. 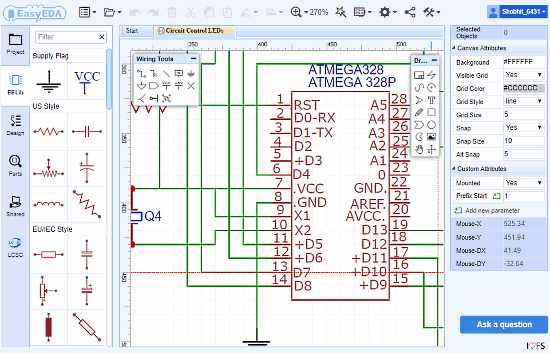 Here, you can design basic to advanced level electronic circuits. It has some circuit designs that you can use as a template in your design. With more than hundreds of components, it has a search option which made finding a particular component very convenient. In this simulator, you can perform a test run of your design for manual input values. It analyses your circuit and represents the values in graphical form. 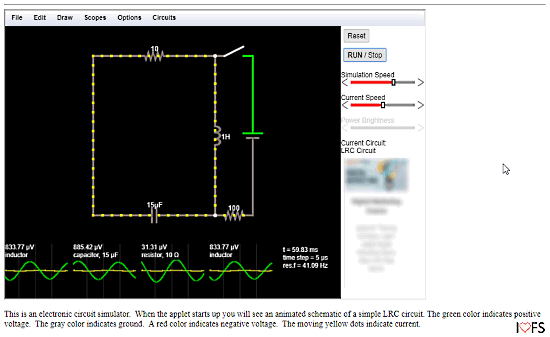 For example, in the screenshot below, I ran a Full-wave Rectifier circuit in the simulator, it analyzed the circuit and plotted a Voltage-Time graph for that. The electronic design can be exported as a BOM file to your PC. Also, you can place an online order for all the components you used in your design right from the simulator. 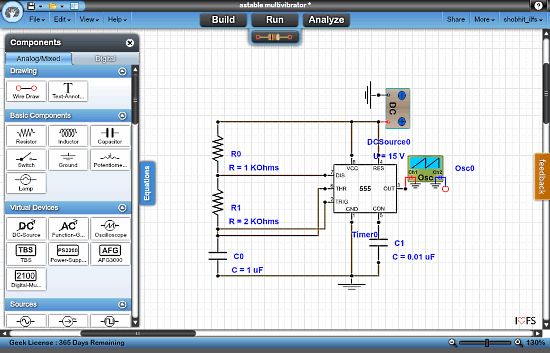 DoCircuits.com is an online circuit lab where you can design basic as well as complex electronic circuits. It has a huge library of online circuit designs to start with. You can search for a specific circuit in the library and clone it to your lab. Most of the input components are dynamic here, means you can assign any possible desired values to those. In the test run of your circuit design, you can customize the input current type, current value, and the time interval for the simulation. You can also perform DC Analysis, Frequency Domain Analysis, and Time Domain Analysis on your circuit. The circuit will be automatically saved to your account on DoCircuits.com. You can also download your circuit design as a CKT file or export it as PNG. DigiKey.com is an e-commerce website for electronics components and circuits. It has an online circuit simulator where you can design electronic circuits. This circuit simulator has the biggest circuit library compared to other simulators in this list. You can find almost any kind of component using the search option. 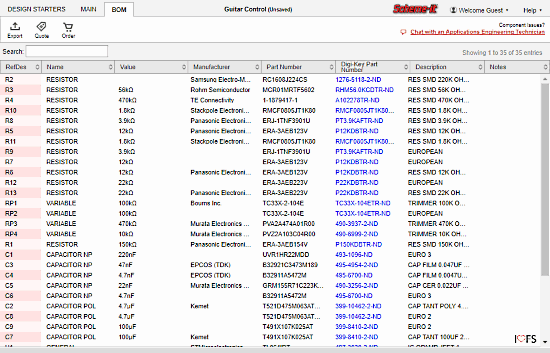 Electronic components in this simulator are rich in details; you can easily find the manufacturer, value, and part number for any component. With this information, you can easily buy it from anywhere. It has an Import BOM option to import a BOM circuit file to the simulator. You can also export your circuit as a BOM file to your pc. As Digi-Key sells electronic circuits, you can easily order all the components used in your design. Tip: Import your circuit design (BOM format) from other simulators, and with one-click, it will add all the available components to your Digi-Key shopping cart. EasyEda.com is a free online circuit designing website where you can design electronic circuits and PCBs. 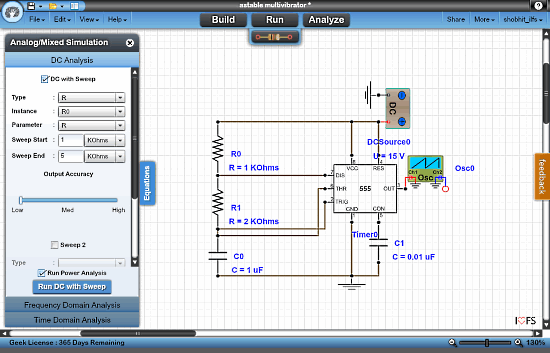 This free circuit simulator has professional-grade features. You can color-code your circuit, control components’ functionality, and convert the circuit design into a PCB design. In case your desired component is not listed in their library, you can search in the shared library which has hundreds of user-contributed components and modules. After designing your circuit, you can color-code the components and add text for guidance. You can also limit the values and functionality for the applicable components. The design can be exported as BOM file and you can also generate multi-layer PCB layout of your circuit. CircuitLab.com is an online circuit simulator where you can simulate intermediate level electronic circuits. This simulator is best for learning because of its clean user interface and availability of almost every basic component. And, you can export your design as PDF, PNG, or SVG file. The electronic circuit can be tested with desired DC value for any specific period of time. You can also run Time Domain and Frequency Domain simulation to analyze your circuit further. All these online circuit simulator websites discussed in this article are easy to use. Most of them have a decent component library to design any type of circuit. And, some of them also let you analyze circuits for time and frequency domain which is great. Try them out lets us know which one satisfies your need best.